A Father’s Day Special to those who administer their paternal duties with aplomb! Father’s Day aka June 18 this year will be all about gifts and greetings alike. Rather, why don’t we take a moment to reminisce and reflect on how our dads have made us into what we are today! This applies, both literally and figuratively to the world of wilderness too. While we may be used to hearing accolades about mommy’s love, there are those spouses who do their own bit too, albeit humbly and silently. 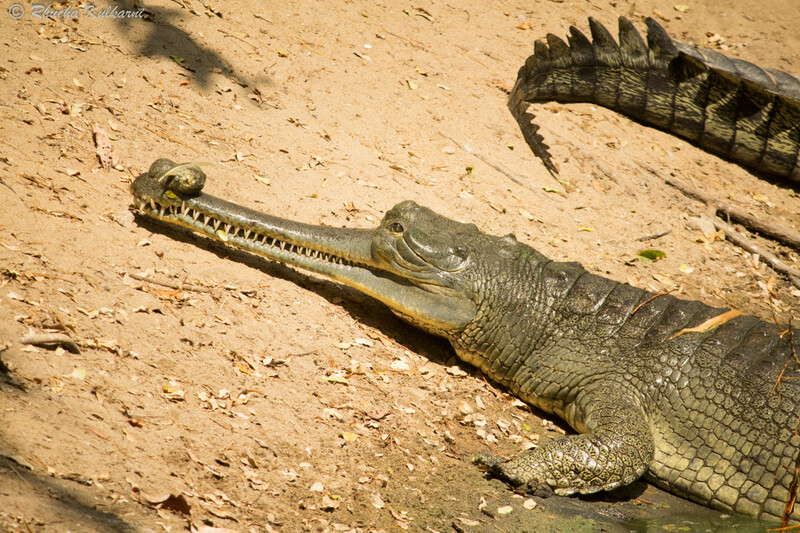 Here is our Father’s Day tribute to one such wild dad- the Gharial Dad! You would have seen the gharial with its narrow snout with that “ghada” or “bulb” at the end. In fact, the “gharial” derives its very name from the word “ghada” meaning a round water-pot. Note, that this round structure is peculiar to male gharials only, females lack it altogether. That makes gharials the only crocodile to exhibit sexual dimorphism i.e. males and females can be distinguished on sight. Though the exact function of this bulbous “ghada” is not known it is said to aid in gharial reproduction by helping females identify mature males and acting as an auditory instrument for courtship. A free and fun ride on Daddy’s back! 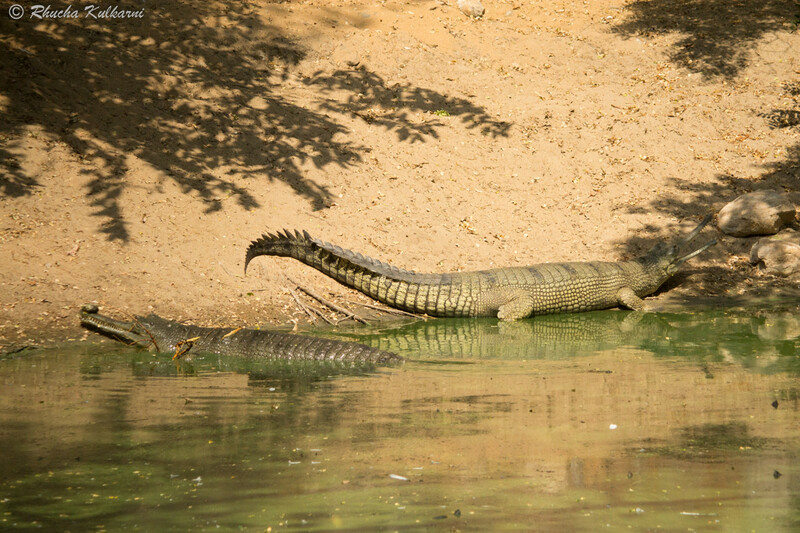 So what makes us go gaga over the paternalistic qualities of gharials? It is the fact that after birth, it’s Daddy Strongest who literally “carries” the young ones on his back! So much so for some huge ferry and a free ride, the kids would agree! The mating season of gharials lasts from December-February, with extensive courtship rituals. The female has a gestation period of 70 days, after which she lays around 30-60 eggs by digging holes in steep sand banks and then covering the eggs up with sand. The nesting period is around March to May i.e. the dry season, which enables the female to find dry and sandy banks to create hole-nests. The mother guards the nest actively and hatching occurs mostly just before the monsoon season. The mother digs up the nest once the hatchlings hatch. There is no record of the gharial (mother or father) carrying the young ones in the snout to the water front, unlike most other crocodiles. Once the tiny tots are up and going, is the time for the father to pitch in for parental care. Both the parents take on the responsibility of protecting the young ones, sharing responsibilities like a lovely new couple, and the father is often seen carrying around a group of little ones on his back. Instances have been seen where the father protects the young ones from the predatory eyes of herons and mongooses. Or daddy dearest may just shed a bite of his own food and drop it in the water for the babies to gorge on. Clearly, a gharial father has a gentle side to him, when it comes to the survival of his offspring. This is an anomaly from the general laws of nature, wherein the mother is the predominant and often, the sole caretaker of offspring. We seldom see such responsibility being taken on by the father. Even in Indian societal conditioning, care of the offspring is primarily considered to be the mother’s job. Yes, things are changing with changing social norms and an increasing number of women are going to work while fathers are playing macho-males to their kids! Maybe we can take a page from the gharial’s life and learn a thing or two about shared paternal care. After all, isn’t Father’s Day the best time to say thanks to this beautiful beast for giving us some insights on paternal care! Gharials once roamed the wild frontiers of the Ganges and the Brahmaputra, even deriving their scientific name i.e. Gavialis gangeticus from it. The species is native to India and Nepal. After becoming critically endangered (IUCN Status), they have been largely reduced to the National Chambal Sanctuary. They are exclusively river dwellers, capable of growing up to 7 metres, with long slender snouts. They have webbed rear feet, making it difficult for them to lift their bodies upwards to walk on land. The gharial is the only living species today of the family Gavialidae, once known to have five species under it. A gharial is a piscivorian i.e. it subsists mainly on fish. Its snout is too thin to hold large prey, restricting its diet!